2 Where and How to Hang the Kids Hanging Chair? 3 Are Hanging Chairs dangerous for kids? 4 How many different types of Hanging Chairs for Children are there? 5 Which Kids Hanging Chair is recommended? 6.1 Do I need a swing for my baby? It is not only fun, but it also develops the sense of balance and improves the child´s coordination skills, muscle development and their general fitness and health. Swinging increases concentration which is a real benefit for learning. It is the perfect retreat for quieter children and a place of refreshing oasis where your child can read, listen to music or simply chill out without being disturbed. A child feels much more secure in a hanging seat than in other traditional seats. This is mainly due to the rocking motion and the fact that a hanging seat has a closed cave-like design where your child can take shelter for a while and achieve internal harmony again. Kids need more than just a bed, children’s desk & chair to make their living space feel complete. A unique and eye-catching hanging chair can make the kid’s room really attractive. 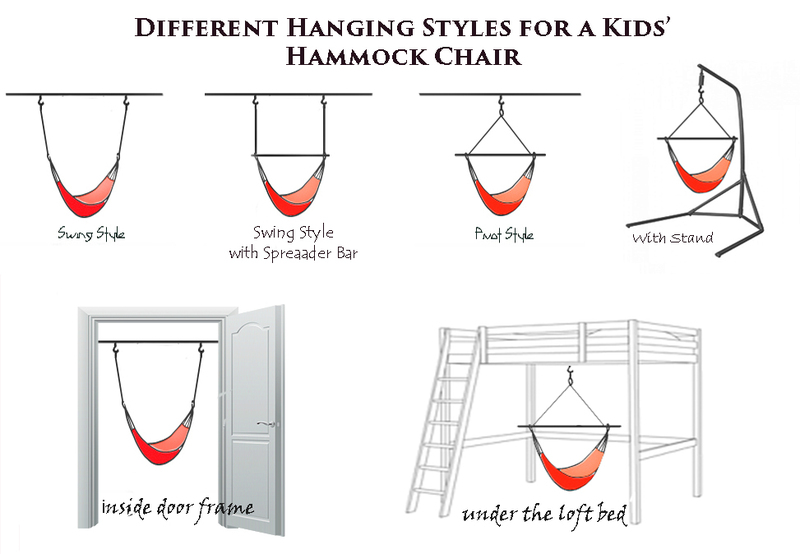 here are 7 more reasons to buy a hanging chair for kids! Swinging, spinning, and rocking are great for children not only for fun and motion but also to help their bodies to regulate their sensory system. Swinging in a hanging chair stimulates the sense of balance and can powerfully impact the brain’s ability to process and use sensory input. 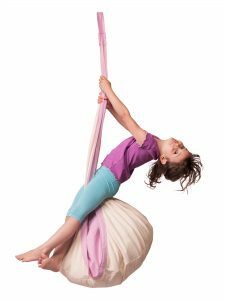 Whether the child is linear swinging or spinning in a rotating movement, all of these movements can powerfully influence the sense of balance and activate the body’s system. And for grand schoolers, a hanging chair is the laziest way to get smarter. The researchers in the neuroscience show that swinging synchronizes brain waves , is relaxing and can increase concentration. Reading in a hanging chair becomes more pleasant for your child, which obviously is a real benefit for learning. Where and How to Hang the Kids Hanging Chair? Hammocks, hanging nests and hanging chairs for kids – all of them are adapted to the special needs of the children and much recommended. A hanging chair has an advantage over a hammock, especially in small children’s rooms – it needs only one suspension point, which can be placed in the ceiling, under the loft bed or even inside the door frame. Are Hanging Chairs dangerous for kids? Some parents are perhaps in fear that their child might get hurt in a hanging chair. However, these concerns are unfounded. Kids need to test their physical abilities, trust their bodies and learn what they’re capable of. Of course, a certain caution is always to keep risks to a minimum, especially if the hanging chair hanging over hard ground. In general, one should avoid attaching a hanging chair for children over the tiled floor. The best location is above soft carpeting. This avoids dangerous head injuries in case of an accident. In general, one should avoid attaching a hanging chair for children over the tiled floor. The best location is above soft carpeting. This avoids dangerous head injuries in case of an accident. How many different types of Hanging Chairs for Children are there? 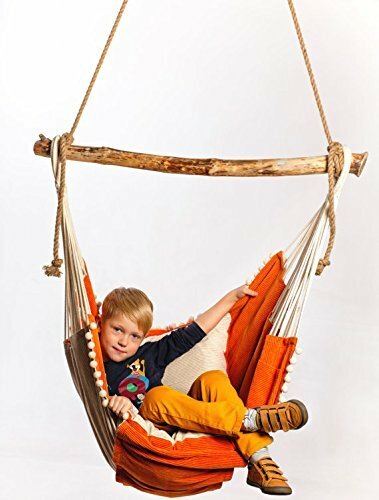 The classic hanging hammock chair for children is very similar to an adult hammock chair. The difference is of course in the size and capacity and in the closed-weave suspension, instead of the usual hammock cords, which provides an additional safety measure. Otherwise, just like a model for the adults, it consists of a fabric seat, a spreader bar, a swivel and a suspension set. 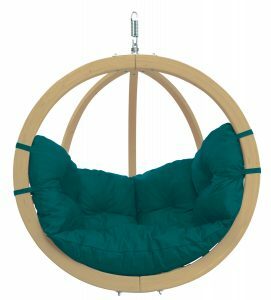 This classic hanging chair is a great place for kids to read and relax, but it is also suitable for wilder children who like climbing, spinning and swinging. 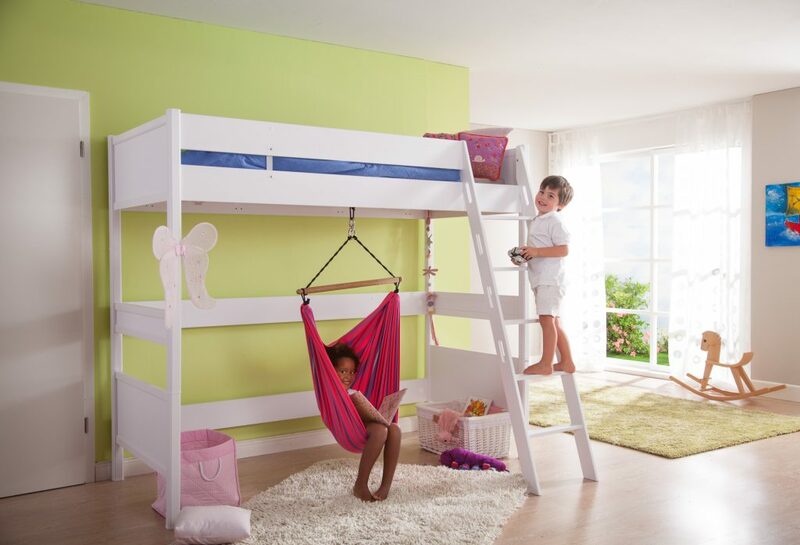 If you prefer a model as a quiet retreat for your child, then you should definitely choose a hanging nest chair. This kind of hanging chair has a unique construction and it is open only on one side so it looks like a little cave or like a cocoon that hangs from the ceiling. The seating surface is padded with a thick cushion. 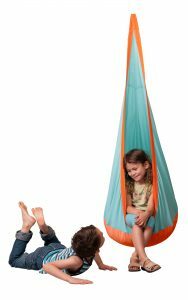 The hanging nest is a perfect retreat to for dreaming and hiding and it is an absolute favorite choice among many children. Here you can read our review of Hanging Nest Chair JOKI, one of the best in the market. The most active children do not seek a quiet oasis for relaxing, but funny indoor exercise equipment – and what could be better than an indoor swing? Swinging, spinning around and shaking here is not only allowed but even encouraged – enough space in the children’s room or a suitable place in the garden are of course a prerequisite. 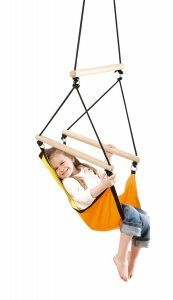 Most suspended swings are also incredibly comfortable thanks to its padded seat. If you prefer a hanging chair made of wood, the Amazonas Globo Chair is our ultimate recommendation. This unique round Globo Kids Chair is made of many layers of weatherproofed spruce wood and can be used not only indoors but is also a beautiful addition to any backyard. Which Kids Hanging Chair is recommended? Hanging Chair by La Siesta -Fun Fun Fun! Don’t buy the cheapest hanging chair you find! It may look great and colorful, but we recommend buying a high-quality product which is free of unnecessary toxic chemicals that can cause asthma, allergies, and other health problems. It is difficult to verify correctly consumer product safety standards for no-name manufacturers; therefore, we strongly recommend purchasing a model of well-known brands when buying a hanging chair for children. Children have different preferences, but we can encourage you- you cannot go wrong! In every kind of kids hanging chair, a child can both -play and relax. Since infants and toddlers under 3 years are too young for a classic hanging chair for children, there are two special forms specially developed for the youngest ones – baby hammock and baby swing chair. Their structure is adapted for babies and small children, so these protect the child from falling out, ensuring through their gentle rocking for a quiet and fast asleep and to take naps in. Do I need a swing for my baby? That’s the probably the first question. So we asked some mothers preschoolers and they still can remember that sound of silence while their baby quietly lied in a baby swing and enjoyed its gentle rhythmic motion. They say- it was a golden investment! 30 minutes only for you to do whatever you want while your baby is happy or takes short naps in a baby swing! What more reason do you need? No doubt, there is no replacement for a mother’s arms, but all arms need a break! 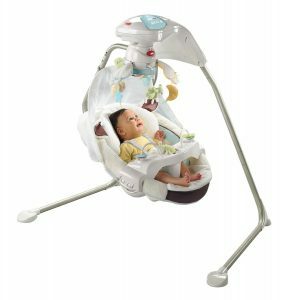 Though a swinging baby chair is something you’ll need for a short period of time, it is well worth the investment to help new parents get through an awesome but sometimes hectic and tiring time with a little one. This piece of gear is definitely one of the things that will help relieve stress for the entire family. The problem is, there are so many different models out there, each with all sorts of fancy seemingly unnecessary features that you’ll never need. The market for hammocks and hanging chairs for kids and especially for babies is huge, making you have the agony of choice. We’ll have a detailed look at high-quality manufacturers and their popular models, so you can have a reasonable basis for making your own decisions on the purchase of a suitable baby hammock for newborn or baby swing chair for 3 to 6 months and older babies. A few tips on how to buy a good one at the best price available in the market.